France is known for many things, and its contributions to literature and the arts are very near the top of those things. I was there twice in 2018 and my travels were mainly for pleasure … and gastronomic pursuits. I managed to eat in two Michelin starred restaurants and not have to declare bankruptcy. First, I visited L’Atelier de Joel Robuchon, located on the Champs-Elysees, and recipient of 2 stars (BTW: 3 is a maximum awarded by Michelin). Robuchon is the most awarded chef in history, having gained 28 stars for his world-wide restaurants before his passing last year. My wife Sue and I went to dinner with high expectations, and we were not disappointed. What really impressed us was the presentation of each dish, which was expected, but the flavours were even more impressive. This, for me, was a real bonus as I’ve eaten in many fine restaurants that deliver on the presentation side but utterly fail on taste. L’Atelier delivered, in a major way, on both sides of the culinary spectrum – artful plates and delicious food. No wonder he was the all-time champion of the restaurant haute cuisine world! Hopefully some talented apprentices will carry on at his fine restaurants. The second Michelin rated restaurant was in the lovely village of Cucuron, located on the south side of the Luberon mountain range. Our experience was quite different from the one we had in Paris. Whereas in any Joel Robuchon restaurant you’ll rarely (read never) see the great chef, in La Petite Maison de Cucuron the jovial chef, Eric Sapet, serves most of the food. We opted for his tasting menu, consisting of five innovative courses, along with the wine pairings. The whole experience was more informal than our Paris dinner, and more fun. I hit it off with Chef Sapet. At one point he joined us for a glass of wine and upon leaving he gave me a copy of his Cookbook! La Petite Maison is a 1 star according to the Michelin Guide but given the warm hospitality, I’d give Chef Sapet an extra star. Enough of my foodie focus and back to my recent visit to Paris and Provence. 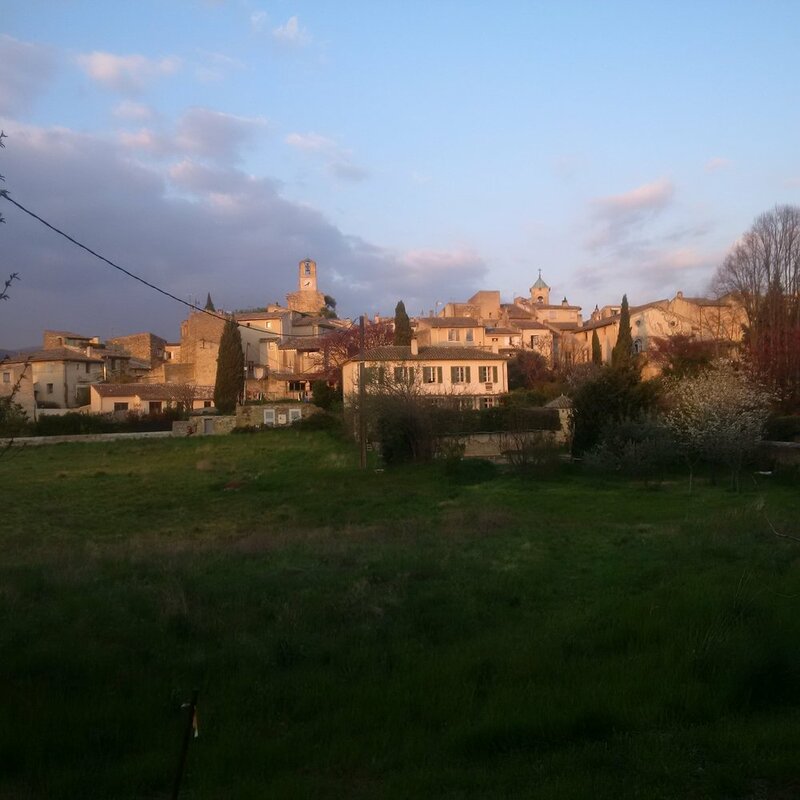 Sue and I rented a house in the village of Lourmarin for the month of March. We left Canada in late February and landed in Paris, where we stayed for a few days. We decided to have our first meal at the Brasserie Lipp in an area known as “Saint-Germain des Pres”. I first ate there in the 1980’s and had forgotten their service style. The wait staff are mainly older men dressed very formally, many of whom have been there for over 20 years. Each dish is brought in a larger vessel with spoons to help you in putting the food onto your plate … it’s almost a mini version of what we call “family style” in Canada. I loved it! Brasserie Lipp has been in business for over a hundred years and has seen dozens of literary celebrities like Marcel Proust, Jean-Paul Sartre and Paul Verlaine, along with stars of the stage and screen including Catherine Deneuve, Francis Ford Coppola, Madonna and Oliver Stone. The food has been described on social media as a throwback to authentic French cuisine and the décor has barely changed from the bohemian days of the Rive Gauche. The restaurant has sponsored an annual literary prize, the Prix Cazer, since 1935. The prize is named after one-time owner, Marcellin Cazes and only goes to authors who have never won any other literary prize. 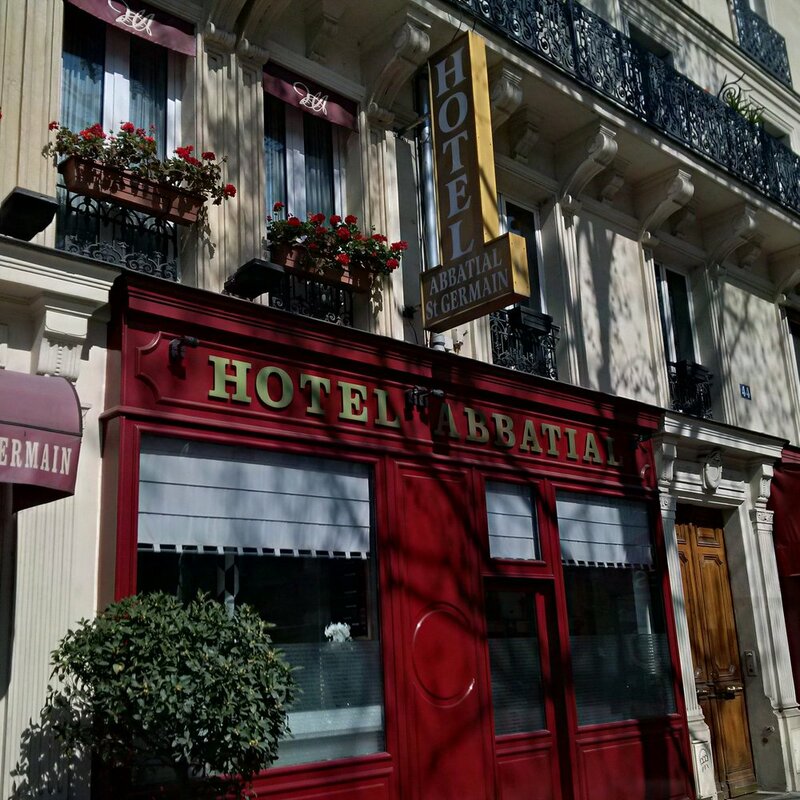 The story of Brasserie Lipp alone would make Saint-Germain des Pres famous but it is only part of the story of this remarkable intersection on the Boulevard Saint-Germain (which also has the oldest church in Paris on one corner, Eglise St-Germain des Pres.) Across the street from the Brasserie Lipp are two equally famous landmark restaurants. First, there’s the famous Les Deux Magots which was a major rendezvous for writers - especially some of American “expats” writers like Ernest Hemingway, F. Scott Fitzgerald and James Baldwin. Artists and intellectuals like Albert Camus, Jean-Paul Sartre, Simone de Beauvoir, Pablo Picasso, James Joyce and Julia Child were also frequent patrons. Next door to Les Deux Magots is the equally famous Café Flore with its Art Deco interior. This coffee house was also frequented by famous intellectuals and artists. Along with Les Deux Magots, Café Flore was a hot bed in the development of the Dada movement and surrealism. In short, Saint-Germain des Pres is a must stop for any literary history buff. Where the hell would you ever find a place where so many ideas have been developed and so many artists frequented. I still find a certain energy about the place and never fail to visit it when in Paris. Close by to this literary landmark is the Pantheon. Located in the Latin Quarter, it was originally a church dedicated to Saint Genevieve. However, in 1791 during the French Revolution the church was turned into a secular mausoleum for housing important French intellectuals like Voltaire, Victor Hugo, Emile Zola, Marie Curie, etc. One final stop for those, with a literary bent, in the area must include a stop at the iconic English language bookstore, Shakespeare and Company, at 37 rue de la Bucherie. Its original location on rue Dupuytren was opened by Slyvia Beach. Beach famously published James Joyce’s Ulysses which had been banned in the U.S. and Britain. Her bookstore became a hang-out for the so-called Lost Generation of writers like Hemingway, Fitzgerald, Ezra Pound, Gertrude Stein and Man Ray. I can attest that, although not the original location, it is an amazing bookstore. It has regular author readings, as well. 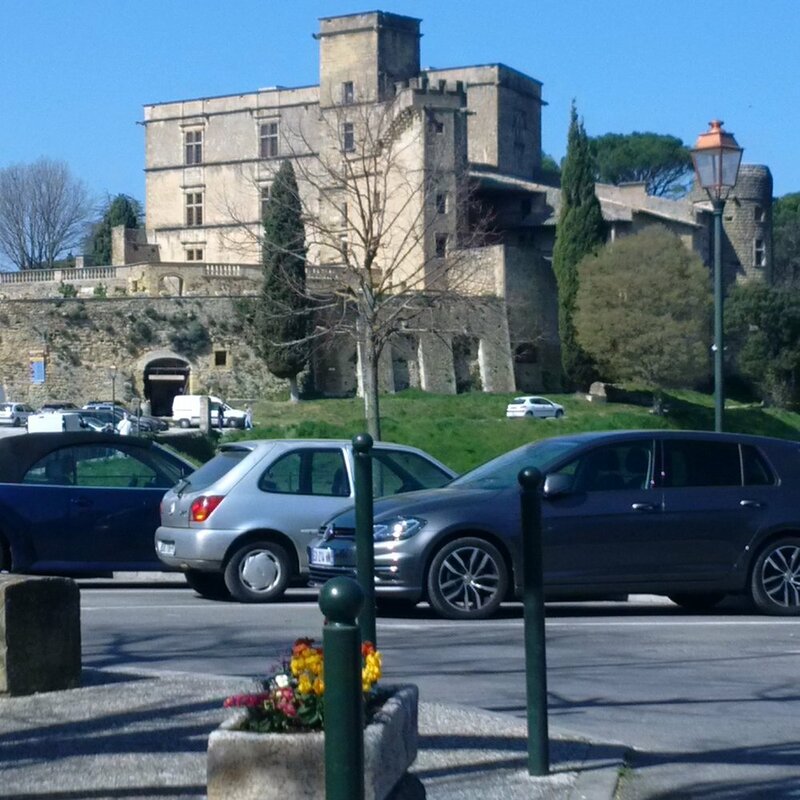 After leaving Paris Sue and I traveled to the village of Lourmarin. We rented a home for the month of March. 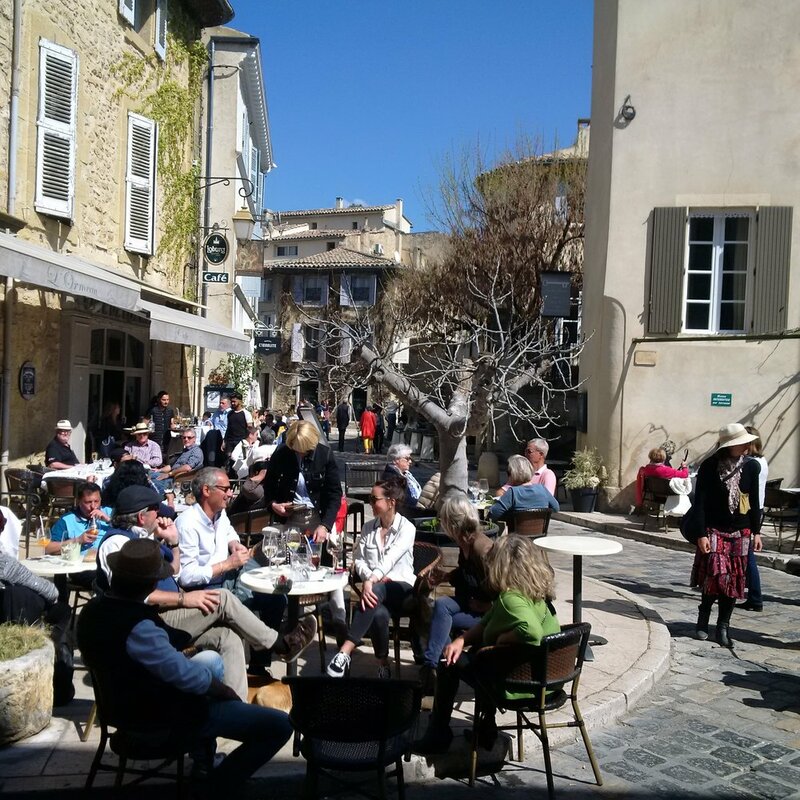 Lourmarin is a vibrant little town with many artists, boutique shops, cafes and some good restaurants. The town also boasts a fine market every Friday… we were lucky to be there when both asparagus and strawberries were in season; (for those who love farmer markets I recommend the nearby market in Cucuron held every Tuesday - it is one of the prettiest settings for a market that I’ve ever seen. Located around a 14th century pond (etang) which is bordered by spectacular plane trees). The literary importance of Lourmarin was attached to the philosopher of the Absurd, and sometime existentialist, Albert Camus. Camus, the second youngest recipient of the Nobel Prize for Literature, loved this village and spent a few years in Lourmarin, and was buried in its main cemetery. What I did not know was there was another equally famous writer who loved and lived in Lourmarin. His name was Henri Bosco and his many awards included the “Grand Prix National des Lettres” (1953) and the “Grand Prix de Litterature de l’Academie Francaise” (1968). He was also nominated for the Nobel Prize four times! In the 1920’s Bosco also worked with R. Laurent-Vibert in the restoration of the Chateau de Lourmarin. Today the Chateau is a cultural foundation and is the home to many musical events, and lectures and seminars on various subjects. The Chateau is an outstanding building and looms peacefully over the village. I highly recommend a tour of it. Regarding the food and beverage scene one can always start in the main square, Place Henri Barthelemy. Our favourite café was called Bistrot de Luce where priorprietors, Fanny and Tomas provide great service and snacks. There are also two restaurants that stand out in this picturesque village (it’s described as one of the most beautiful villages in all of France by most tourist guides). For classic foods of Provence I recommend eating at ‘La Recreation” restaurant… kind of a funny name, but the food and service won’t disappoint. The folks in charge are what I call real operators. For food with a more modern flare but also featuring local products I highly recommend “Numero 9” restaurant. Again, the staff are true operators as they keep the atmosphere light and fun, while being very efficient. It’s a true gem. After a month in Lourmarin Sue and I started to seriously look at real estate listings. 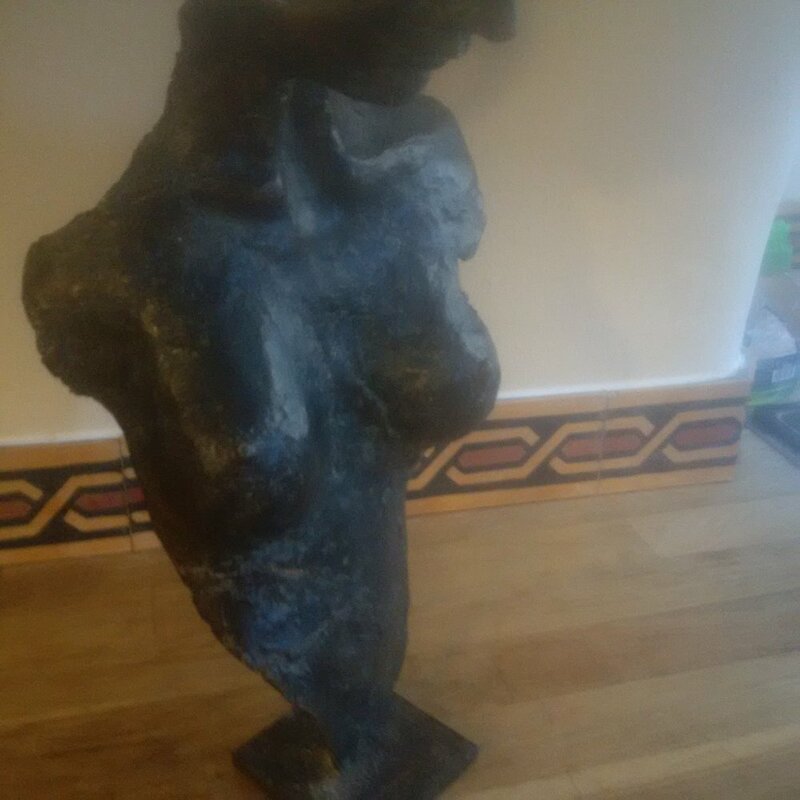 We met so many nice people, fell in love, all over again, with fresh bread… and appreciated an overall tendency in Provence of making things beautiful… whether it be statues, fountains, doors or gardens…there is a strong culture and pursuit of beauty. One of our favourite encounters was meeting the artist Daniel Adel who has three studios in town. Adel is a master of portraiture… his portraits not only faithfully portray their subjects but they also exude personality and character. He also paints abstract art which is quite extraordinary (we bought a small picture). Adel’s work has appeared on the covers of many magazines, including Time. Visit his gallery located in Place Henri Barthelemy and say “hello” from me. 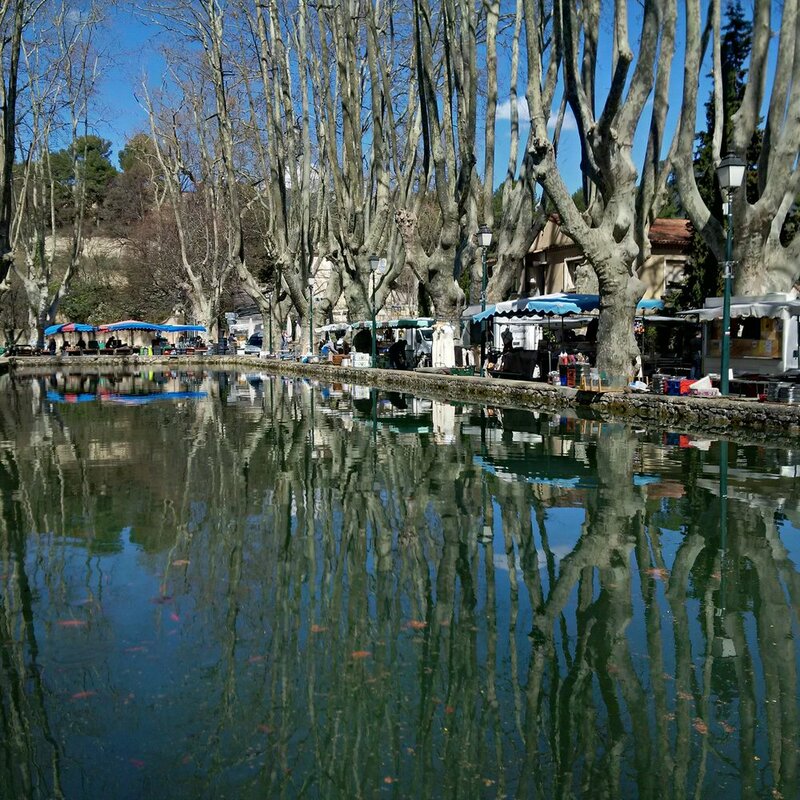 And then continue to walk the streets of Lourmarin and bathe in its charm. 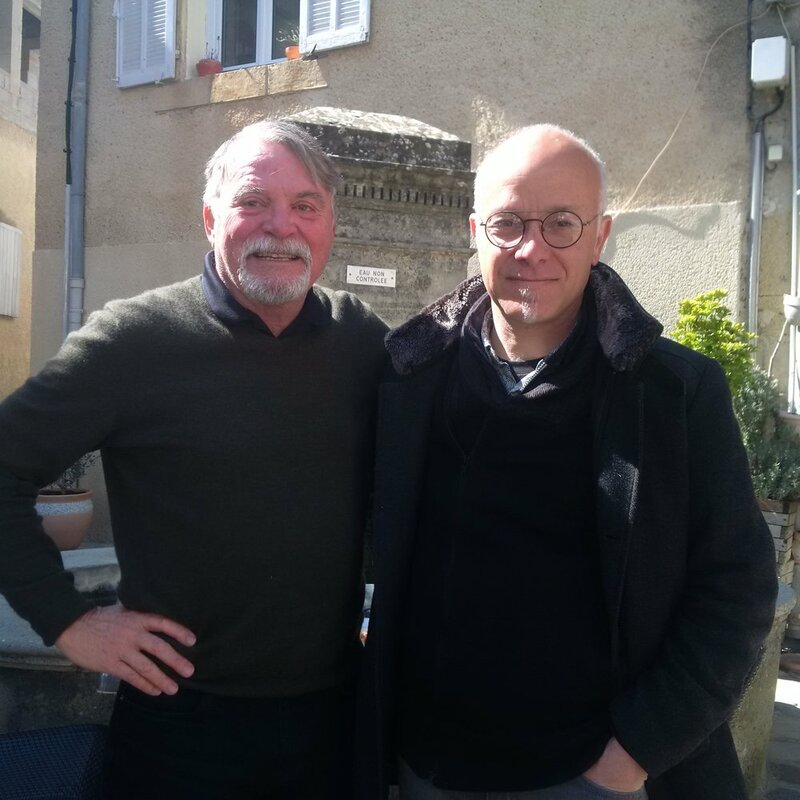 Author Desautels in front of his rental house in Provence. *For Paris this hotel delivers good value in a great location. "He's a global thinker. He changes the world in front of him..."